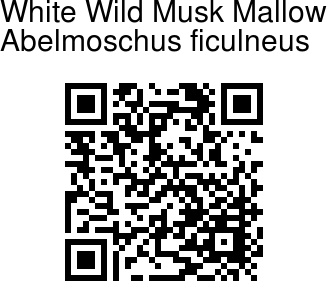 White Wild Musk Mallow is a small erect shrub. It grows 2-5 ft tall and spreads 2-6 ft across. Leaves are 5-8 cm long, 4-7 cm wide, circular, heart-shaped at base, toothed, rough on both sides, 3-5 lobed. The flower stalks occur at the end of branches or in leaf axils. They are covered with velvety hairs. The flowers are 5-7 cm across. 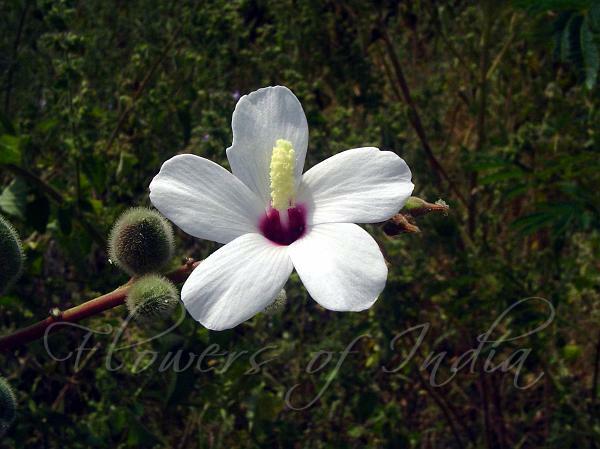 The flowers have short stalks and are white turning pink, with a dark purple spot in the centre. Stamen tube is about 1.5 cm long. Flowers last a couple of days. The seed capsule is 5 angled. The plant has small hairs which cause itching. Identification credit: Prashant Awale Photographed at Warora, Maharashtra & Panipat, Haryana.